I don’t know that I have ever made the same quilt twice. Wait, maybe that isn’t entirely true. I have definitely made the same quilty gifts in multiples. Like the Christmas table runners I made for my family one year. Or the zip pouches I made for gifts last year. But not full quilts. Those have always been different. There are so many amazing quilt designs out there and I haven’t yet repeated one. Clothing patterns? Those I will repeat. Time after time after time. When my kiddos were tiny I would make flannel pj’s for them, using the same pattern until the pieces were so pin marked I would have to tape them together. My Washi dress? Just repeated that one and I am so glad I did. Here are my thoughts on why. The first time I use a pattern I have to learn the pattern. Even though I have been sewing for so many years (44-ish years?) it takes a minute to just look at the pieces, read the directions and figure out the process. Using the pattern a second (or third, or fourth) time that process is complete and doesn’t need to happen again. Of course, the cost of the pattern. I think I paid about $12 for the Washi pattern, I am not sure. So why not distribute that across a few garments? Kind of like dollar cost averaging in the stock market. 😉 Make it once and you have spent $12 plus the cost of fabric and notions for the one garment. Make it three times and you are at $4 plus fabric and notions for each garment. Might as well get as much bang for your buck as possible. My confidence level increases with each garment. Going in the second time, I knew where the problem areas might be and already had solutions for those. For instance, in the first Washi dress, I found that the elastic bobbin used while shirring the back would need to be reloaded with each stripe of shirring. I still don’t understand why but at least, this time, I didn’t have to fool around to figure out a solution. It makes for a more peaceful sewing experience. With the extra confidence in the pattern, I can challenge myself in other ways. For this dress, I chose a knit fabric. I wasn’t sure what it would mean to make a pattern designed for woven fabrics with a knit but I felt good about trying it because I was already familiar with the pattern and how it fit me. I would not have done this the first time using the pattern because I wouldn’t have felt confident in the result. There are so many variations to be had. For the second dress, I chose not to cut the dip in the neckline. I was concerned that with a heavier fabric (knit vs cotton) the neckline would not lie flat with that cut out. I used the scoop neck version instead. Also, I tried it without the sleeve cap, didn’t like it and put the little sleeve on in the end. Here is the finished Washi, version two! The drape is very soft. After washing and drying it, there was no issue with wrinkling. The shirring wasn’t as tight with this version. I suppose that has to do with the knit vs cotton issue but I am not sure? If I make it again with a knit, I would play with the stitch size a bit while shirring it. Also, with the stretchiness of the knit it feels a bit too big. So if I do a repeat, I will cut it down a bit, especially in the bodice. I also learned a bit more about sewing with knits. I wasn’t sure how to finish the seams since I don’t have a serger machine. 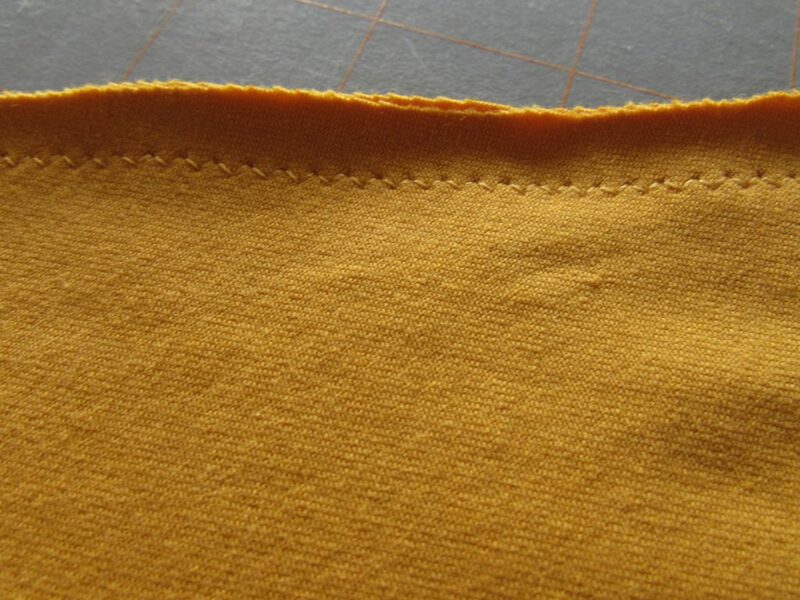 Looking through some great garment sewing websites, I found one that instructed me to use a tiny zigzag stitch on all of the straight seams (like the side seams.) This sort of intimidated me but it worked out wonderfully. 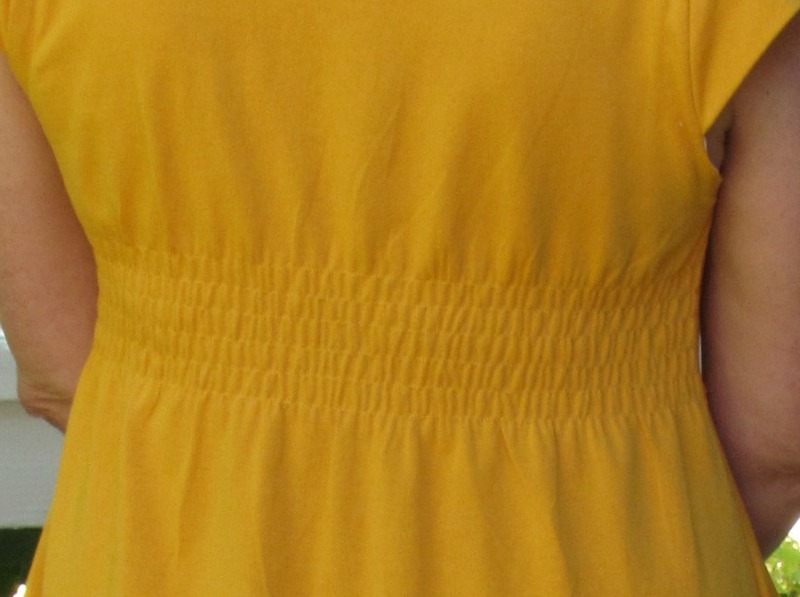 This tiny zigzag stitch made a big difference in how the dress hung. The seams didn’t get wavy because the zigzag stitch allows for some movement with the stretch of the knit. Also, I sprayed the hemline with starch before hemming it. Adding that extra structure made for a nice flat hem. Besides finishing up the dress, I also finished painting the caps of the deck railings. I am so happy because it is supposed to really heat up over the next week or so. Lots and lots of painting! For now, the painting project is a finish and it looks so much better. Don’t you love checking something off the list? Especially something you really didn’t want to do in the first place?? Me too. Have a good weekend everyone. Stay cool during this oh-so-hot part of July. Linking up all over the place. See the links at the top of the page, under Link Ups. In case you are wondering what is going on at Craftsy this weekend, here is the latest. 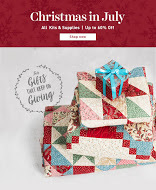 It is Christmas in July at Craftsy and they are offering great deals (up to 60% off!) on kits and supplies so you are able to start working on holiday gift items ahead of schedule. You’ll be ready when the season rolls around. Sale begins today, 7/22/16 and runs through Sunday, July 24th. Check it out! I am a Craftsy affiliate! Thank you for any purchases made via my blog as I will receive a small commission. 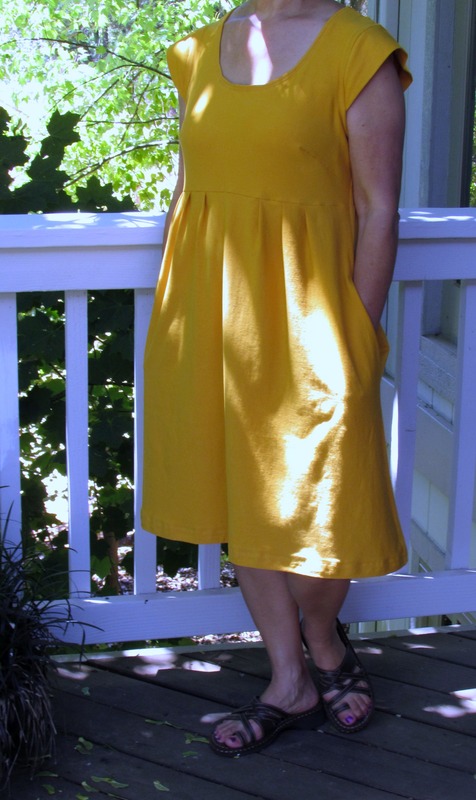 This entry was posted in Garment Sewing and tagged reusing sewing patterns, sewing with knits, shirring, washi dress on July 22, 2016 by Bernie. Bernie, Your knit washi turned out great. The sheering is perfectly done! I love that length too! Thank you Paige. I wore it most of the day yesterday and it was so comfy! Hi Bernie: I haven’t done a lot of garment sewing but because the patterns are so expensive I have made more than one of every pattern…usually the first time I make something I use sale fabric and then move on to something I love. My friend the good dressmaker has added the sleeves from the Scout Tee to the Washi to get a garment she could wear going into the fall. I’m going to her house today to work on my first Washi tunic leangth I think. Yes, I have seen the versions with sleeves. That would be a cute version to try. Have fun sewing with your friend! Hope the tunic turns out to be adorable. I think your reasons to make multiple versions of a pattern are good reasons to give anything a second try. I think the color is really lovely on your second Washi dress, and like Paige says above, it is a great length! Congratulations on marking some to do items off your list and I hope you have a great weekend. Thank you Yvonne! Hope y are marking a few off of your list too! I think your dress turned out great!! I have made one dress in my life (home ec in high school) and remember thinking this not for me! So I am totally impressed when I see someone do it well. I really like that mustardy color that you used too. I suppose sewing clothing isn’t for everyone but maybe you would be surprised if you tried it now. I think it is much easier than making quilts. Who knows?! Thanks Mari. Wasn’t it fun sewing for little girls? I made lots of shorts and pj’s for the boys but dresses and nightgowns were lots of fun to make. There is a sleeve on Rae’s website that can be downloaded for this pattern. Maybe I will give that a try for fall. ? Your dress looks great, nice and comfy and very flattering. I would like to try this pattern but would have to purchase an e-pattern as we live so far away, I expect. Or maybe a shop might post one out, I’ll have to check my options. The pattern is available in print at Craftsy.com. That is where I ordered mine. It is in a kit with fabric and I never used the fabric for the dress- I think I will use it for a quilt backing. Let me know if you have any questions. I am happy to help! Good reasons to repeat! I love your yellow Washi. It fits really nicely. Thank you. I like the uniqueness of the first neckline but this one lays flatter. I don’t truly understand why it is harder for you to get patterns. Are there no fabric stores there that stock the popular patterns? I am unfamiliar with the U.K. But I would love to better understand. The other option is to buy PDF patterns that download but then you’ve got the hassle of printing a lot of pieces, taping them together and tracing them on to pattern paper. Haha! I have done that too. Finish something and add it to the list. So satisfying. And maybe slightly neurotic. ? That is quite a lot of painting indeed! Looks great…fresh and clean. And your dress turned out beautifully ! I really like that pattern and am glad that you went ahead with your plans to make another one. Yes Deb, it was a lot of painting. I still have some touch up to do but the lion’s share of it is done. Ah, a feeling of accomplishment. I won’t be painting this week tho because it is supposed to be triple digits this week. Yuk! I’m enjoying your posts on the Washi dress. I’m tempted to make one, but I’d have to adapt it to a plus size, and I’m not too good at that. 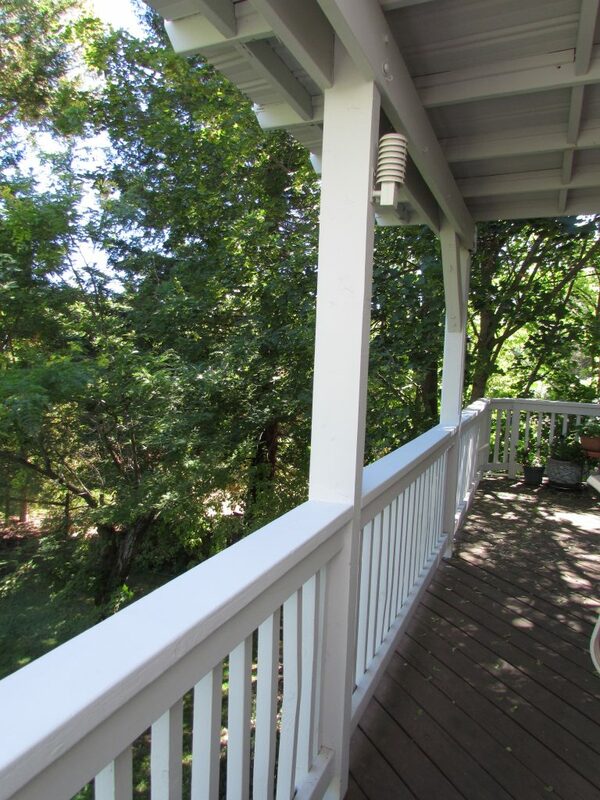 Your deck looks lovely — and I can understand why you didn’t paint the spindles now that I see how many there are! 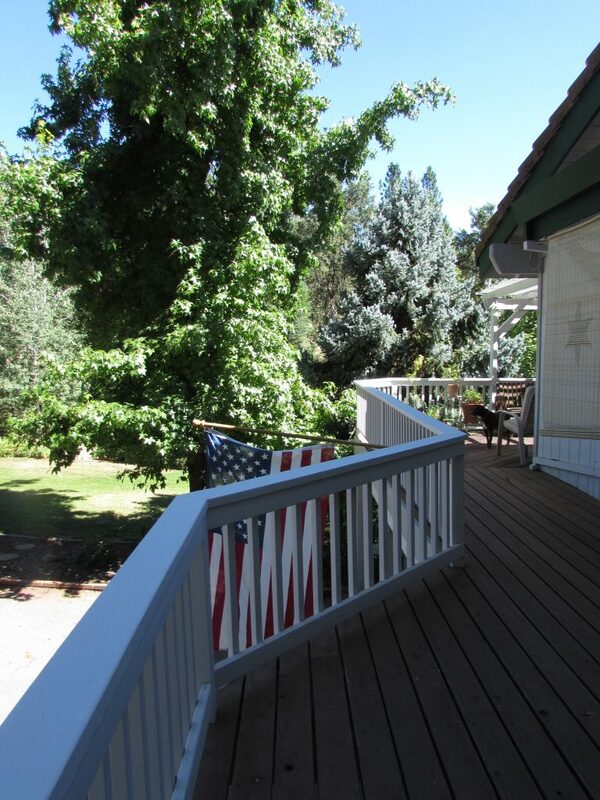 We have a similar style to our deck, which is soon ready for another staining. We are all ignoring that fact as long as we can (we being just the two of us now)! I ignored this all last summer and it got even worse over the winter so there was no avoiding it. Not a fun task but at least it is done now. ? I don’t sew garments very often any more as everyone has grown up. Occasionally I make shorts for the grands but I use the same pattern over and over. This summer I had to make some adjustments, but that’s easy enough. I think of using the same pattern as a way to save money. Changing the fabric makes such a difference that anyone who doesn’t sew would likely not even be able to figure it out. I’m very impressed with your Washi dress. You have me tempted to give it a go! It is such a great pattern. Yes, the different fabrics make each project unique, even if the pattern is the same. So much fun! Your knit washi turned out beautifully! i’m impressed that you tried it with knit fabric. I bet it is extremely comfortable! Thank you Amanda. This dress is the greatest. It feels like I am spending the day in my jammies. So comfortable!